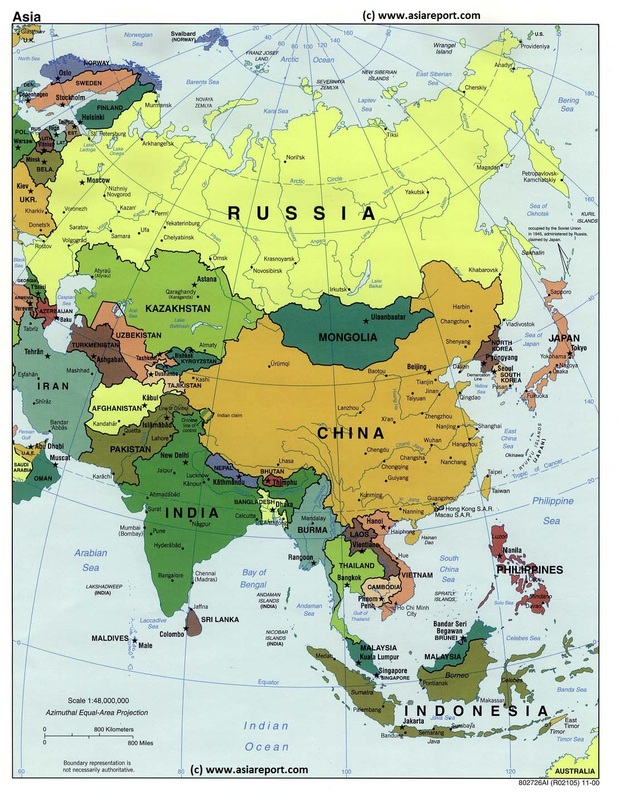 Maps of neighboring Nations and Territories such as the Russian Federation, China (P.R.C. 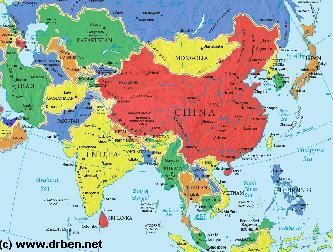 ), and parts of Manchuria and Siberia. A schematic Map of Russia and the Russian Federation giving an overview of the location, names and relative sizes and shapes of all Russian Federal Territories. Territories are color coded in order to signify nature. 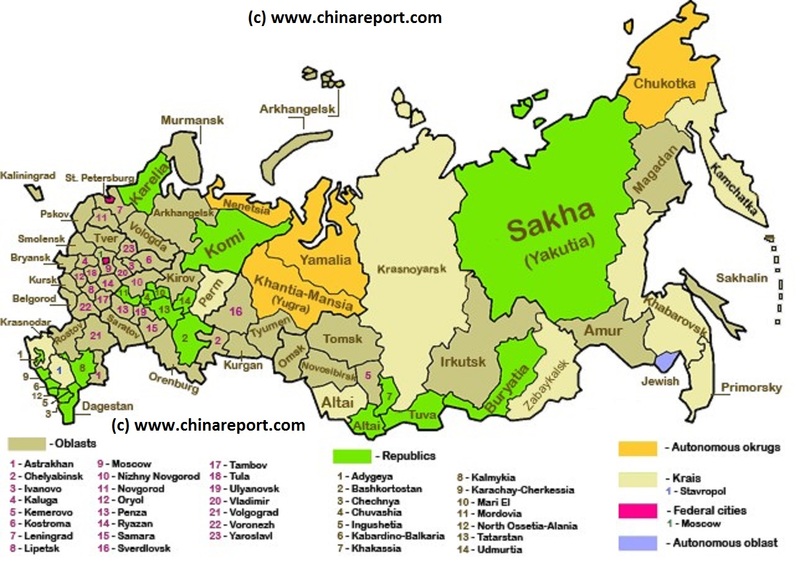 Among the territories are Russia; and 46 Oblasts, 21 Republics and 8 Krai's, and additionally 2 Federal Cities (Moscow), 1 Autonomous Oblasts and 4 Autonomous Okrug. Not included in this map are territories recently invaded by Russian Forces in northern Georgia (2008 ; Abkhazia and Tskhinvali Region (South Ossetia)) and in Ukraine (February 2014-ongoing), in the latter case primarily The Crimea, which has since been (re-) annexed by Russia Proper. A Satellite Image based Map of the the North-Eastern (Manchuria) Chinese Province of Jilin (with parts of Liaoning Province), the Chinese-North Korean Border, Part of Russian Primorsky Krai (Maritime) Province of Siberia in the Russian Federation, and the Nations of North Korea (DPRK) and South Korea (ROK) on the Korean Peninsula. Mouse over Map includes the Capital Cities of surrounding provinces and Nations, a rough sketched idea of the location of the Chinese-North Korean Border, the location of Border Towns and rivers, main mountain peaks in Jilin Province, cities and villages, the Yanbian Korean Autonomous Prefecture of Jilin Province in China and last but not least the roughly sketched location of the DMZ, the Demilitarized Zone between North- and South Korea established along the 38Th Parallel. Map includes Turkic Languages (Uygur, Kazakh, Kirghiz, Salar & Uzbek), Mongolian Language and Sub-Divisions (Mongol, Tu, Daur and Dongxian), Tungusic Peoples (Oroqen, Evenki and Xibe) and Languages, Korean, Tajik (Tadzhik), Mon-Khmer (Kawa + Puman (or Pulang)), Hui, Uygur (Uighur), Tibeto-Bhurman Languages, Tai & Miao, Yao & She' Language Area's and Borders. Main Area's and sub-divisions of Han Languages (Northern Mandarin, Eastern Mandarin, South-Western Mandarin and Cantonese) further included. 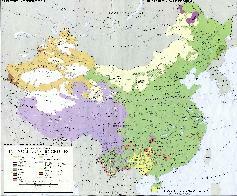 This color-coded ethno-linguistic Map (1967 AD) identifies at a glance most ethnic minority regions in China & includes information on Ethnic Korean Area's. This Satellite Image provides an overview of all cities and provinces within the Peoples Republic of China, on the Korea Peninsula and more. Locations visible lie roughly between Kabul in Afghanistan in the West, Osaka in Japan in the East, Krasnoyarsk in the North and Sanya on Hainan Island of China in the South. Find the large coastal cities and main Chinese Civilization Centres on the Chinese Plains between Beijing i/t North o/t Plains and Hong Kong, Macau and Guangzhou (Canton) in the Extreme South. Follow the Flow of the Yellow River and cities and towns strewn along it from Xining in Qinghai Province, through Lanzhou, Gansu and Yinchuan, Ningxia to flow along the Western Shanxi Province Border and find the black holes created by the Gobi & Taklamakan Deserts, the Tibet-Qinghai Plateaux and the DPRK. 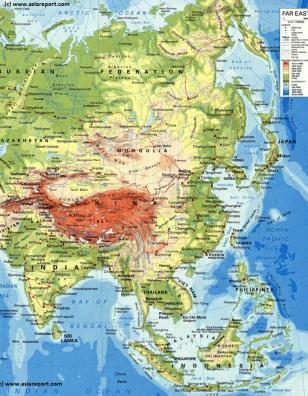 The Asia Report introduced GMaps on All Levels of its Online Publishing's in April of 2009. 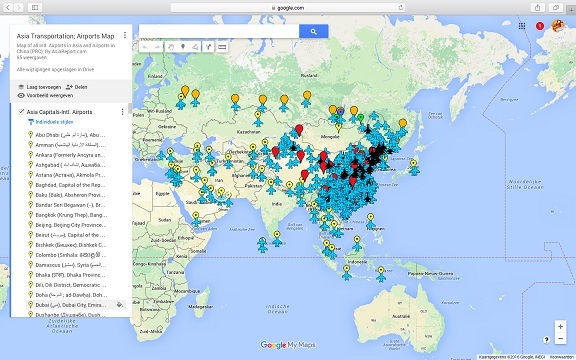 Find Google Maps on nearly all Report & Photo Pages where appropriate and useful. (http://twitter.com/asiareportcom) for near LIVE Reporting by DrBen and other DrBen.Net Staff and their Mobile Devices on all nearly all Digital Channels. 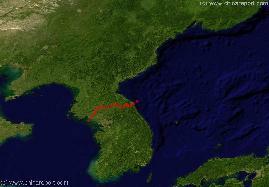 Adjacent Map gives direct access to the Map of Korea by Google Earth. An overview Map of South Korea (ROK), depicting all Main Cities, Towns, Highway Connections, Roads Rivers, Sea Bays and Lakes, Airports and Airfields within the Country. Further included are several cities, towns and important locations within North Korea (DPRK), the rough location of the Korean Demilitarized Zone (DMZ) and its maritime counterpart the Northern Limit Line (NLL), the location of various United States and Korean (ROK) Military bases with details of names and stationed units (where available), and a wide variety of small towns and villages in South Korea. Browse the Map and follow the links to more information on each location, landmarks or monument. An overview Map of North Korea (DPRK) created in 1979. This Map inludes Main Cities of North Korea and adjacent regions of South Korea (ROK) and Jilin Province and Liaoning Province of China (PRC). Further included are Main Roads and Highway Connections, locations of main rivers and mountains, border cities on the Chinese Border and South Korean Border, the 12 main provinces of North Korea, trajectory of Korea's DMZ (De-Milititarized Zone), locations of main historic monuments & tourist sites of the Nation & Region, location of DPRK Main Army and Naval Bases and Yongbion and Yongbion Nuclear facility. Map under Construction More information to be included soon !! This Satellite Image clearly shows North-East China, Manchuria and the Korean Peninsula, all to varying degrees covered by a Haze of Gobi-Dust Cloud being caried from West to East. 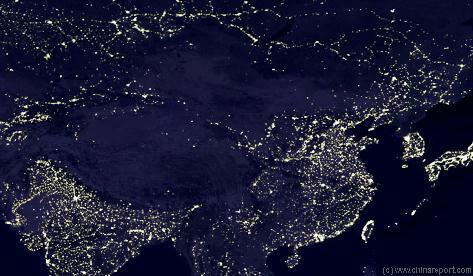 Clearly visible are the North-China plains, bordered in the North and East by a semi-continous mountain-range ( Damaqun Shan in the North near Beijing, more south-westernly Guancen Shan near Datong and then further South along the plains Taihan Shan (Luliang Shan ). East of these mountain-ranges are the Yellow River Bassin and the Central Chinese Highlands, the Loess Lands of which are the origins of the Yellow Dust. Covering large parts of Ningxia, Henan, Shaanxi and Shanxi Provinces, the yellow river basin is dry and mainly in spring winds gather the dust. 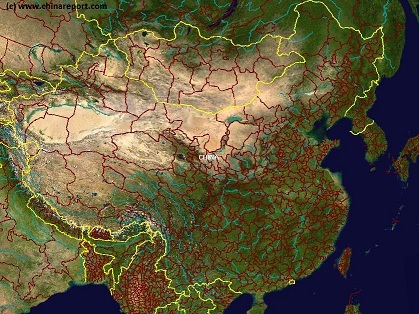 Part of the Yellow River's 5000 kilometer flow can be distinguished and is marked on this Map (Better Map Click Here). Names and locations of main cities in China, Russian Federation, North Korea (DPRK), South Korea (ROK) and Japan are marked. Follow the links where available. 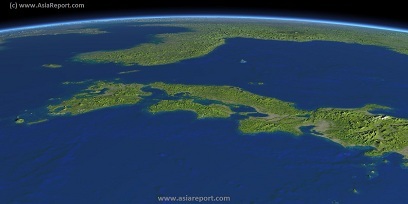 This Satellite Image based Map provides a clear overview of most of the Japanese Islands, the Sea of Japan and its Coastline and the Korean Peninsula, including sections of the countries of Japan, South Korea (ROK), North Korea (DPRK), the Peoples Republic of China, and Primorsky Krai Province of the Russian Federation. Marked on the map for orientatation are the names of major National and Provincial Capitals, cities, several towns and villages, oceans, sea's, lakes and rivers, as well as mountains, national borders, and locations of interest. 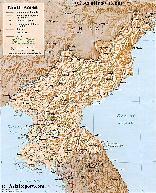 A Complete Listing of All Historical Maps relating to the Korean Peninsula, including North Korea (D.P.R.K. ), South Korea (R.O.K.) and associated and neighboring regions. 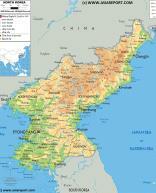 A more recent overview Map of North Korea (DPRK) created in 2002. This Map inludes Main Cities of North Korea and adjacent regions of South Korea (ROK) as well as those of the neighboring territories of Jilin Province and Liaoning Province of China (PRC). Link through via the map to additional information, maps and photo's on each seperate location. A partial overview Map of the maritime border between North Korea (DPRK) and South Korea (ROK), better known as the Northern Limitation Line (N.L.L.). Although accepted by all sides during the Armistice Treaty Negotations, today the N.L.L. remains unrecognized by the Democratic Peoples Republic of Korea, which claims grounds to the south of the Line. 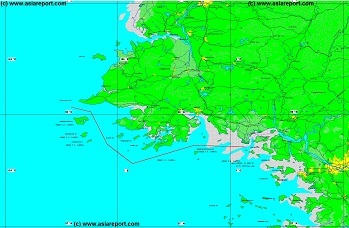 This Map highlights the western half of the maritime border as it is found in the Yellow Sea (West Korea Sea) geographically not too far from both National Capitals of Pyongyang and Seoul. Marked on the Map are Cities and towns of importance, names of relevant coastal islands, local rivers, etc.